“Straws are a gateway plastic,” said Dune Ives, executive director of Lonely Whale, a nonprofit committed to protecting the oceans and marine life. She didn’t mean that using straws eventually leads people to use saran wrap, plastic bags, and ponchos. She meant that giving up plastic straws makes it easier for people to give up other types of plastic and to ultimately think about the impact plastic has on the environment, especially the oceans. The scale of plastic pollution in the oceans is truly staggering. An estimated 8 to 11 million tons of plastic enters the oceans every year — the equivalent of emptying a garbage truck filled with plastic into the oceans every minute. Ives said that because the average human doesn’t interact with the oceans much, the problem isn’t widely known. Straws might seem like a trivial place to start — but the US alone consumes 500 million straws each day. Most of these straws end up in the world’s oceans, where they clot shorelines and gather in thick gyres. They end up being mistaken for food by marine life, which, when swallowed, can cause injury or even death, or they can get painfully jammed into orifices, like with this turtle whose suffering sparked widespread outrage. And straws — coffee stirrers, cocktail straws, big, bendy straws — gradually break down into microplastics that leach toxins into the water and eventually blanket the sea floor. Seen from this macro-perspective, minimizing straws would be a pretty effective place to start in the quest to clean the oceans. And so Lonely Whale launched a campaign with the ultimate goal of preventing 500 million straws from getting into the oceans in 2017. The name of the campaign? #StopSucking. They’re getting restaurants, bars, sports stadiums, brands, and more, to limit how many plastic straws they use and to switch to sustainable alternatives. And they’re getting individuals to pledge to a plastic straw-free life. So how can you stop using plastic straws in your life? These are lightweight, reusable, and don’t have any chemicals or dyes. Brush With Bamboo straws are made straight from stalks and can be easily washed. It’s a pun, but also a good alternative to plastic straws, especially for bars and restaurants looking for a classier design, according to this Kickstarter. These are a single-use alternative to plastic straws. 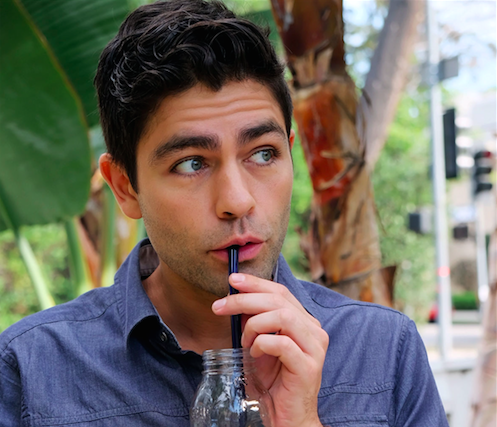 Aardvark straws are durable enough to not break down in a drink and are fully compostable. Steel straws like these from Eco at Heart are durable, easy to clean, and can be carried around in a bag without worrying about stains. Bent glass straws from Be Organic are easier to use than straight glass straws because you don’t have to tip your glass. These straws are made in Bali and support local plastic clean-up efforts. Reusable water bottles and cups with reusable straws and lids are an easy way to avoid using plastic straws. A lot of the time, straws are unnecessary and you can drink right out of a cup. Lids designed for a straw make this a little harder (iced coffee lids, for example), but brands can develop lids that don’t need straws. Starbucks, for instance, recently tested out an “adult sippy cup” for its iced coffee and it works just as well as a straw — I would know, I tried it out with their cold brew.